Today is "Talk Like a Pirate Day." 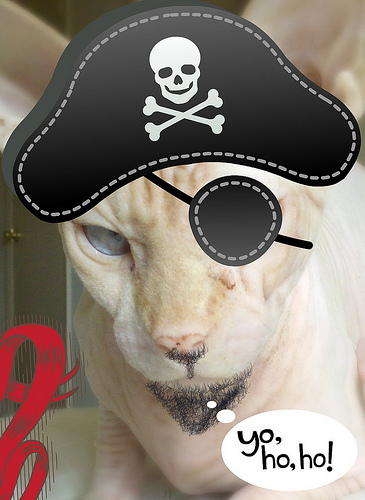 Moshe Moshi would make a great Pirate, although Maus is the cat that talks in Pirate every day (she goes "Arrrrg" when she is excited or wants my attention). I probably will mark the day doing three things; eat pizza with friends, avoiding the Pirate's Tavern Bar, and listen to Michael Bolton. The Pizza thing...well, it's just nice to have a dinner and not have to fight over the anchovies with the cats. The Pirate Bar...if you watch the TV show "Bar Rescue" you understand why I'm not eating at the Pirate Bar (which is in Silver Spring MD, up the street from us). Michael Bolton...he's just a hottie in a pirate costume.